The night she is turning 16, Hiyoki dreams of a man stealing her heart only to find out her heart is really gone when she wakes up! Her only clues about who that man could be are the color of his hair and the tattoo he bores. In order to retrieve what is lawfully hers, she enrolls in the S-Hall dormitories in St. Nazareth Academy after finding out the tattoo is the dorms’ symbol. But it is not going to be as easy as it seems as it turns out in the S-Hall they are all guys! Soon enough, she discovers she has the power to look into other people’s dreams, which may be the key to find out who the thief is as none of the guys in S-Hall resemble him, possibly because she only knows how he looks like in dreams. And how, dare I say, convenient it is when it happens that there is not a spare room for her so she is to share the guys’ rooms in turns! Will she be able to find her heart or will she be left empty for the rest of her life? Very pretty art. I like her contrast between black and white, Not so that many backgrounds, but still ok, especially because her characters look good. It’s so easy to tell by the art that it’s the same author as in Barajou no Kiss. Some characters even look alike. You can tell if you compare the pictures I chose for both of my reviews. 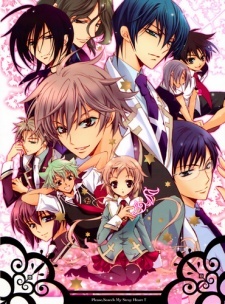 As a harem kind of manga, we have your typical girl and a bunch of guys with very distinct personalities. There is not a really deep character development, so I don’t really have a lot to say in this department, particularly because we don’t get to know a lot about them. It stirs your curiosity about how the next room and the next roommate will really be. You will know who the thief is right away even if at first he is not supposed to be. You know it will work out somehow a the end and it will be him. It’s just so predictable that it hurts! Repetitive. Basically, she goes to a room, finds out something about her roommate, who is not the guy she is looking for, and moves on. All while you already know who the guy is an that she won’t know until she has been in all the rooms. In the first chapter she starts as a character who can feel so little because her heart has been stolen. It’s reasonable. However, she starts behaving normally later, which doesn’t make sense according to what was preciously stated. And the worst thing of all, the story is pointless because at the end it is revealed there has been an empty room all along and it was impossible to all of them not to know. 4 out of 10. Because it is kinda funny and pretty to look at, but that doesn’t make up for the rest of the story. ← Manhwa: Do You Want To Try?